High Concentration Polycrystalline Diamond Suspension for metallographic specimen preparation. Aka-Mono+ and Aka-Poly+ have twice the diamond concentration compared to Aka-Poly and Aka-Mono. When used in combination with Aka-Lube Clear+ this assures outstanding removal rates, allowing for 30% - 40 % reduction in preparation time. 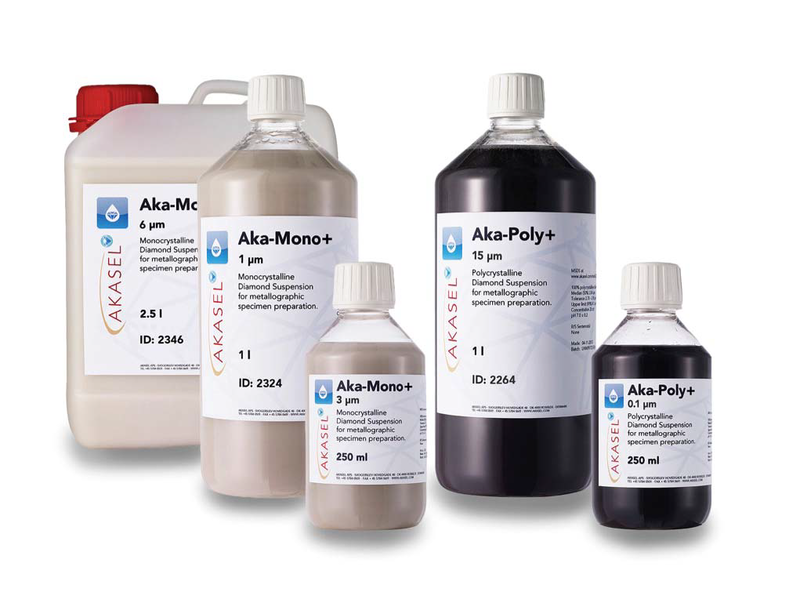 When cost is more of an issue than preparation time, you can reduce the dosing levels of Aka-Mono+ and Aka-Poly+ diamond suspension to half of that used normally. This will give you the same amount of diamonds as with regular concentration Aka-Poly and Aka-Mono and thus the same removal rate and polishing time. The savings in cost of diamond suspension is about 30 % over our already competitively priced suspensions.